ABOVE: A wainscot with battens is enriched by panels of embossed faux leather and decorative brackets under the plate rail. 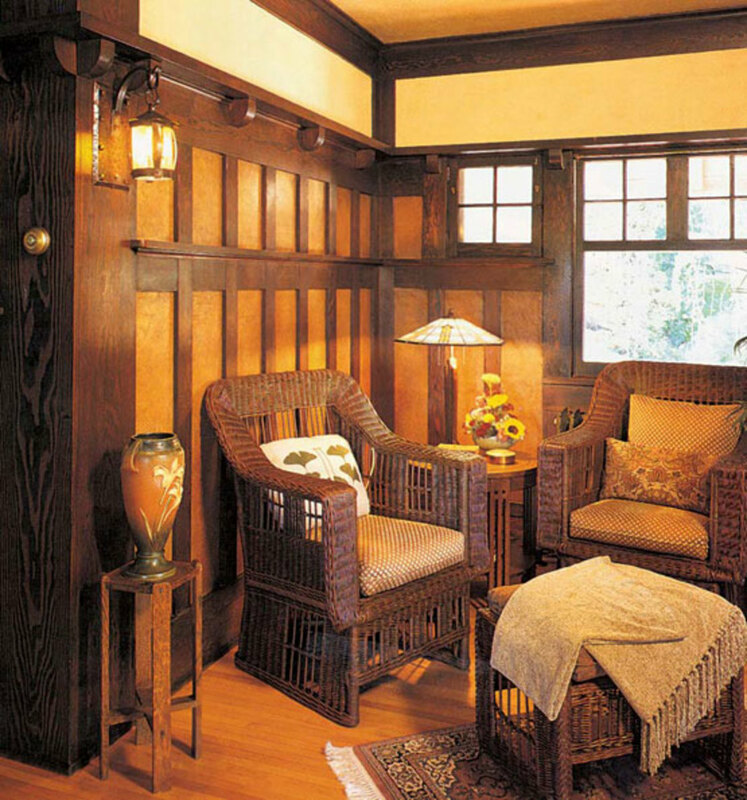 Featuring the mellow warmth of dark wood, original Arts & Crafts wainscots add dimension and a sense of proportion to rooms that might otherwise be undistinguished. 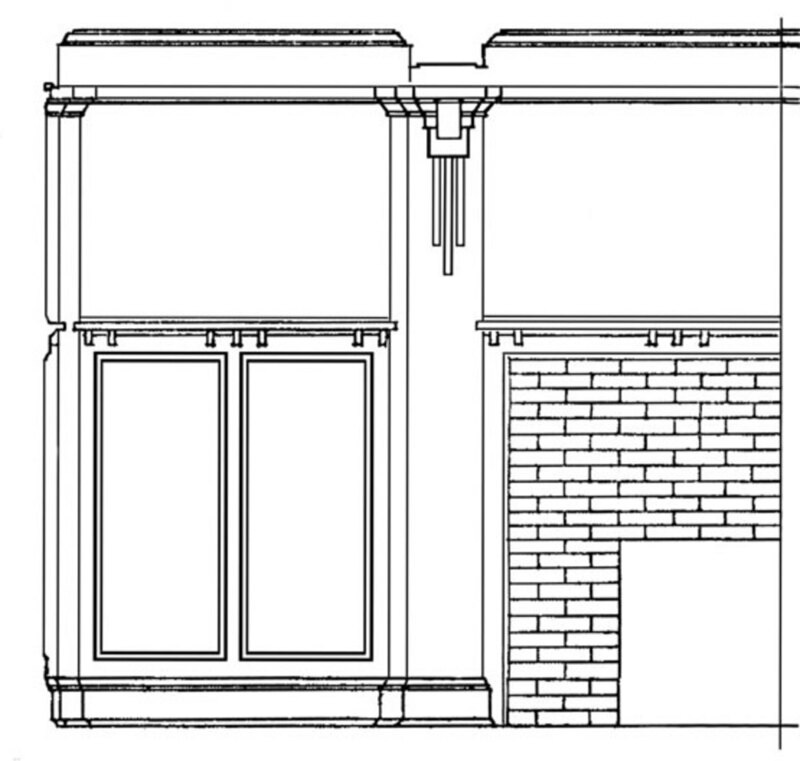 Usually composed of vertical panels capped with a horizontal plate rail, the wainscot in this period typically rises more than halfway up the wall. (A chair-rail height wainscot should be slightly less than half the wall height; say, 4&apos; high in a room with 8 1⁄2&apos; ceilings.) A wainscot that rises exactly half the height of the room visually divides the wall in two, creating a flat, two-dimensional effect—quite a waste of good lumber. 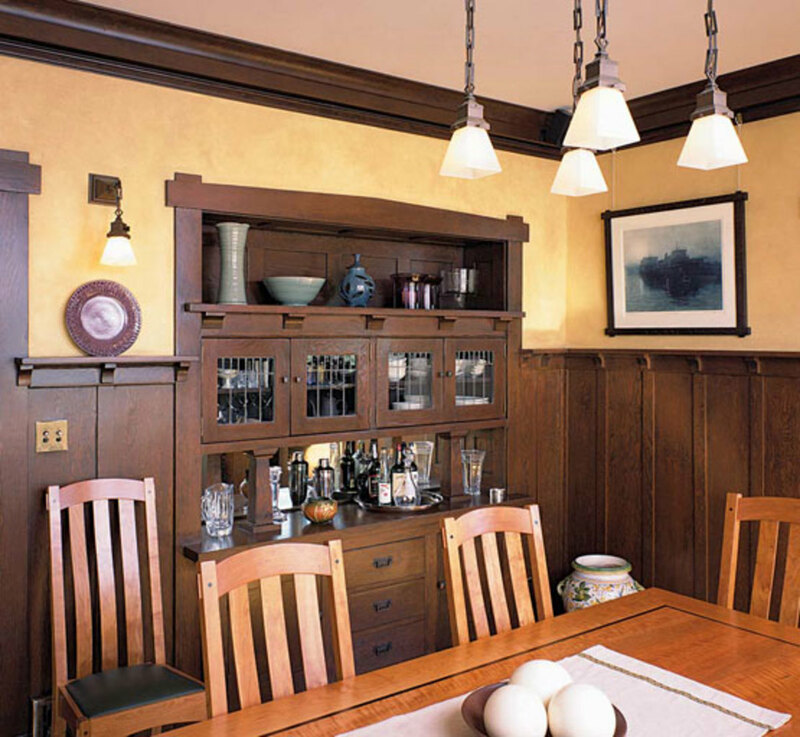 A classic board-and-batten wainscot with plate rail abuts a built-in sideboard. Photo by Linda Svendsen. Perhaps the most common design for an Arts & Crafts wainscot is vertical board-and-batten paneling. This style was intentionally straightforward and economical to build using readily available builders’ woods in oak, fir, cypress, red gum, or Douglas fir in stock widths. A typical configuration butts planks of about 12" or so together vertically. The joints are covered by shallow battens about 2 1⁄2" to 4" inches wide. When topped with a generous plate rail, this simple installation creates the illusion of rich, three-dimensional paneling. A high, two-tiered wainscot in an alcove retains its original leather-like wall covering under the battens. Photo by Douglas Keister. A fancier construction might incorporate a top row of windowpane-shaped panels just beneath the plate rail—easy enough to produce by adding short batten dividers, two to a panel, above a horizontal batten. Still other designs might make use of figured plywood in place of boards for panels (Henry Mather Greene did this in an entry divider in the Gould House, built in 1924 in Ventura, Calif.) In Henry H. Saylor’s 1911 book Bungalows, he recommends alternating vertical panels of V-jointed cypress 6" and 10" wide to create a high wainscot. Although the paper-backed burlap preferred for wall panels is no longer made, medium- to heavy-weight versions of linen union make an excellent substitute. Be sure the fabric is completely opaque when held up to the light, advises Stuart Stark of Historic Style, and use a clear adhesive. Roller a thin coat of the adhesive to the wall (not too much, or the glue will bubble up through the material), then apply the fabric. Simple plate rail of the Arts & Crafts era: top shelf has grooves for holding chargers or platters. 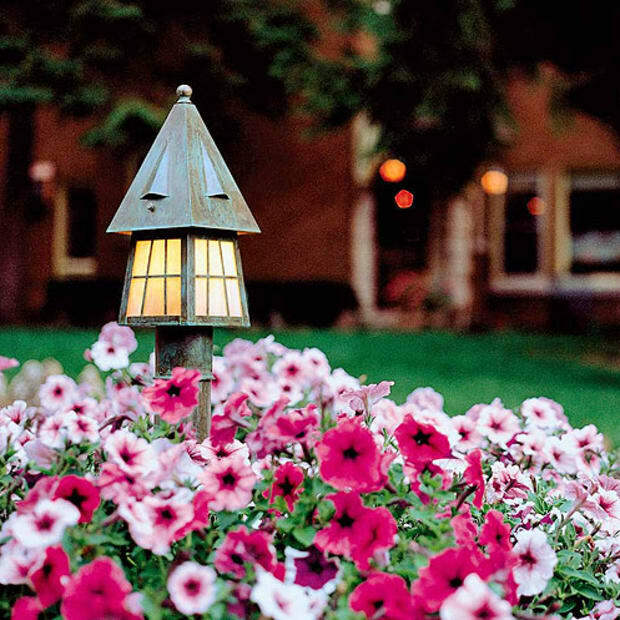 Decorative brackets are usually spaced at intervals or at battens. Refreshing or restoring an existing wainscot can be more work than building a wholly new one, since refurbishing painted or dirt-encrusted woodwork is highly labor intensive. Avoid using any stripper that might remove the wood’s patina. 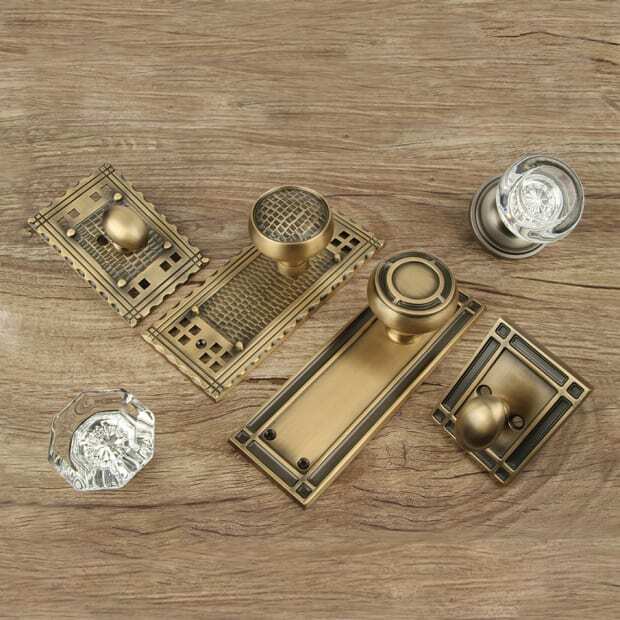 (Fine steel wool and paste wax with elbow grease will do the trick on merely dirty woodwork; citrus-based strippers will usually safely remove paint). There’s no need to polyurethane the cleaned woodwork. 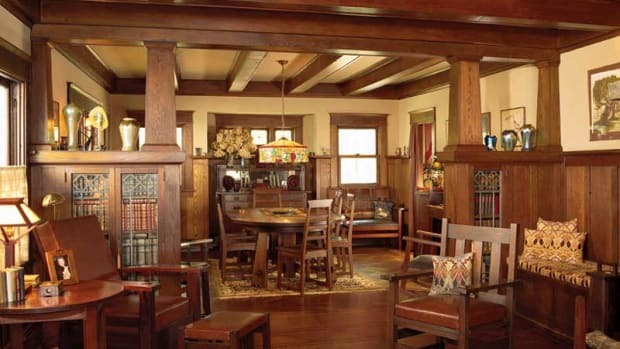 The preferred finish for Arts & Crafts woodwork is shellac, which creates a mellow, golden look no urethane can match. ALL IN PROPORTION: Like a picture frame, a wainscot needs a little more weight at the bottom to look “right” in the context of the full wall. At 5&apos; 6", this plate-rail height wainscot in a 9&apos; 6"- high room is slightly more than halfway up the wall. Note, also, that the panels are arranged symmetrically (in groups of two) on either side of a central fireplace. The rhythm of the wainscot is set by the even spacing of the battens and the height of the rail; panel widths may vary given the dimensions of the room. 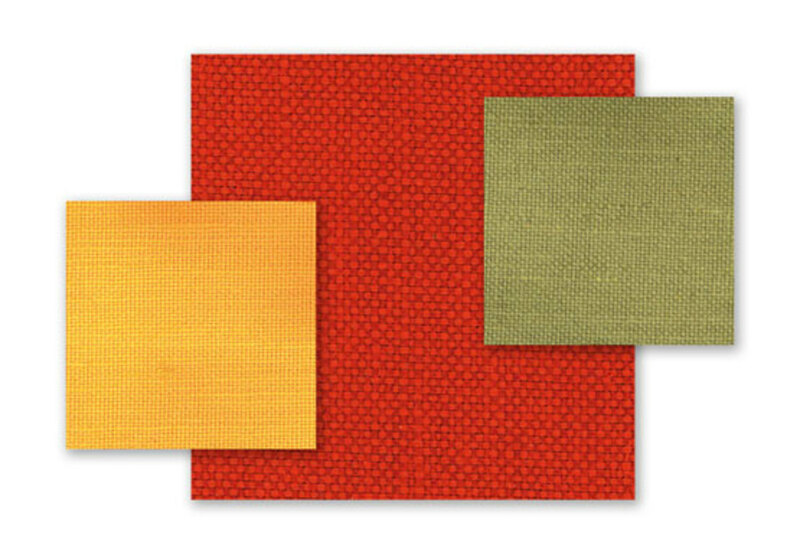 ABOVE: “Burlap” used today for walls should have a dense weave, like thse samples of linen unioin is moss, red, and yellow, from Historic Style. 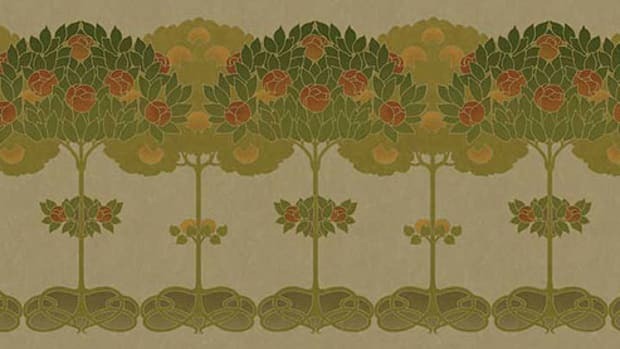 To create an authentic fabric-paneled wainscot, look for densely woven medium-to heavy-weight fabric (14 to 15 threads per inch) with significant linen content. Variously called linen union, bungalow cloth, peasant linen, or Craftsman linen, period-friendly color choices include natural, stone, ivory, maize, russet, blue, moss, yellow, red, dark green, and burgundy. 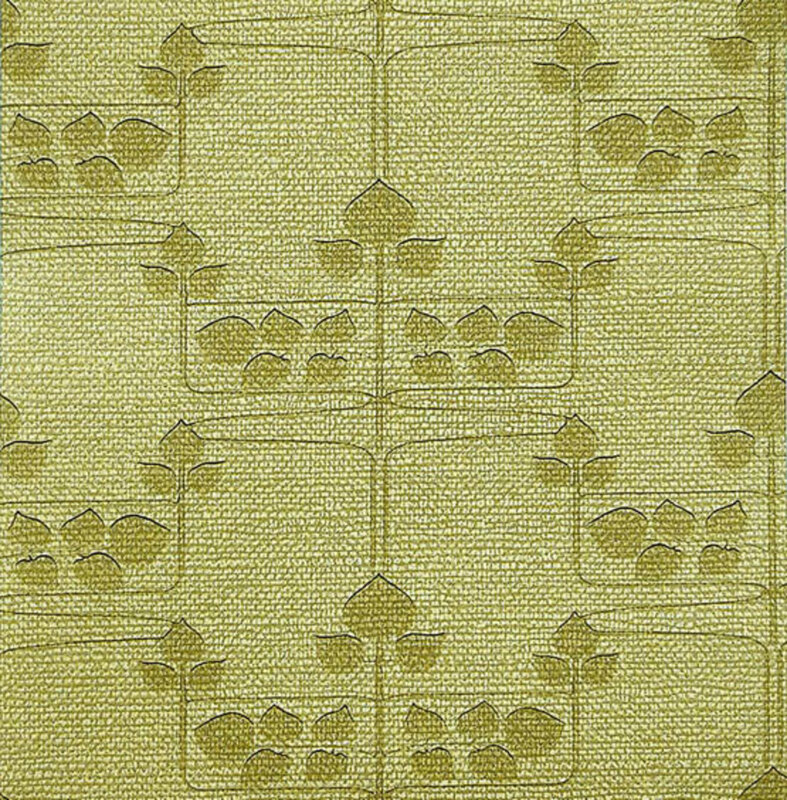 Sources include Ann Wallace & Friends/Prairie Textiles (annwallace.com), Arts and Crafts Period Textiles (textilestudio.com), and Historic Style (historicstyle.com). Another option is yarn-dyed raffia (to the trade only) from Phillip Jeffries (phillipjeffries.com). If you prefer to use textured or figured wallcoverings, Architectural Products By Outwater (archpro.com) and Cumberland Woodcraft (cumberlandwoodcraft.com) both offer Lincrusta and Anaglypta. These materials can be painted, glazed, or highlighted for an especially rich finish. Roden Leather Company (rodenleather.com) offers embossed, distressed, and textured leathers suitable for wall treatments. ‘Stencil Burlap’ is a patterned fabric from Historic Style. 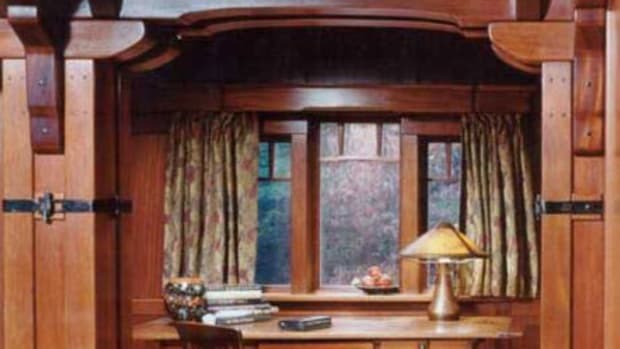 Sources for authentic wood paneling and trim include Bear Creek Lumber (bearcreeklumber.com). They supply redwood, several cedars, Douglas fir, and mahogany. Granville Manufacturing Co. (woodsiding.com) mills quarter-sawn paneling. 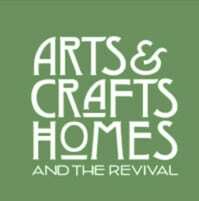 Hull Historical Millwork (hullhistorical.com) sells Arts & Crafts-specific moldings and trim. McCoy Millwork mccoymillwork.com) offers “Craftsman Series” trim; plate, chair, and picture rail. Pioneer Millworks (pioneermillworks.com) makes custom wainscot, paneling, and trim. Shellac is an alcohol-based solution of lac, a natural resin produced from the bodies of beetles. Once dry, clear shellac is transparent with a faint, golden cast that is much lighter than oil-base varnishes. Amber shellac has a warm, orange cast that’s highly typical of woodwork in original bungalows. 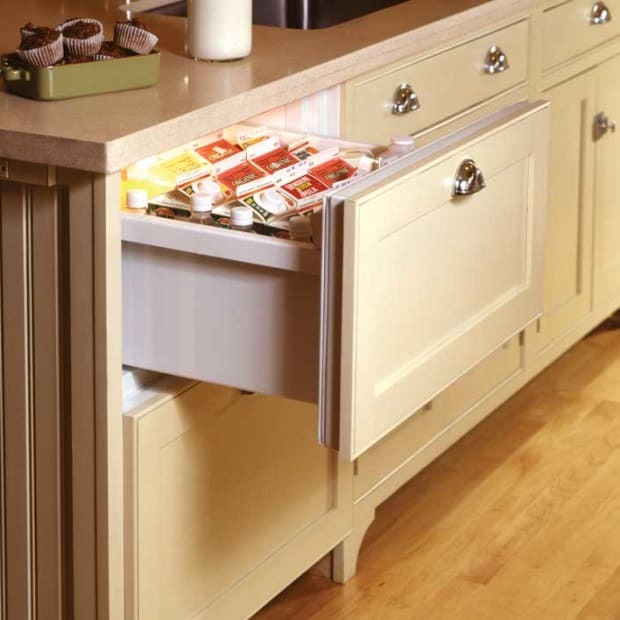 Zinsser sells both clear and amber versions. Woodwork can also be stained or waxed; Minwax makes a full line of stains, waxes, and clear finishes, many appropriate for period woodwork.